By 1/1/2005, an Earth-class planet will be discovered orbiting within the Continuously Habitable Zone (CHZ) of a star other than our sun. "Earth-class planets" are currently defined to be those having masses between 0.5 and 10 Earth masses (Me). Planets greater than 10 Me have enough gravity to attract a massive hydrogen-helium atmosphere. Those less than 0.5 Me are likely to lose any life-supporting atmosphere because of low gravity and the lack of plate tectonics needed to recycle CO2 back into the atmosphere. The CHZ is bounded by the range of distances from a star for which liquid water would exist and by the range of stellar spectral types for which planets had enough time to form and complex life had enough time to evolve, and for which stellar flares and atmospheric condensation due to tidal locking do not occur. 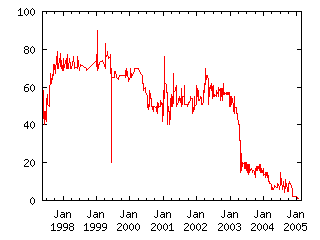 The currently most used definition of CHZ is the one calculated by Kasting, Whitmire, and Reynolds, (1993) for main sequence stars as a function of spectral type. These definitions are borrowed from NASA's Kepler project (see http://www.kepler.arc.nasa.gov/summary.html#anchor420488). If the criteria for Earth-class and Habitable Zone change during the lifetime of this claim (or if similar criteria are developed for moons), the judge should try to use the most current definitions. Additionally, an extrasolar planet (or moon) that can be shown to have liquid surface water and a life-supportable atmosphere will satisfy the claim even if it is not "Earth-class" or within the CHZ. Background: over the past year, scientists have discovered a flurry of planets orbiting other stars (see The Extrasolar Planets Encyclopaedia at http://www.obspm.fr/departement/darc/planets/encycl.html, or the SFSU Planet Search Project at http://cannon.sfsu.edu/~williams/planetsearch/planetsearch.html). So far, the methods used are limited to Jupiter-size planets. However, several teams are working on other methods to find smaller planets, using techniques like interferometry, microlensing, planet transits, etc. Both NASA and the European Space Agency (ESA) are planning missions to look for extrasolar planets from space. See the Darwin project Planet Searches page for a listing of current projects: http://ast.star.rl.ac.uk/darwin/searches.html. I will judge mainly based on wording, with appropriate discretion on defining the technical terms, as mentioned in the claim, and with the understanding that the author is looking for a reasonable possibility of liquid water and life-supportable atmosphere on an extrasolar object, also as mentioned in the claim. Currently, at time of writing in May, 1997, the key reference for defining the terms is the *Kepler Mission* Web reference given. Note in particular the "Nature of the Investigation" page, where the range of acceptable stellar spectral types is currently defined as being between "F" and "K", inclusive, for the primary of an Earth-class planet in a Continuously Habitable Zone. As the claim's author suggests, this may be subject to updates, based on the latest expert specifications available, particularly in the case of possibly earth-like moons of larger planets.